The French Quarter is New Orleans' oldest and most-visited neighborhood. Wrought-iron balconies on Spanish-inspired buildings make up the city's most iconic visages, and the tastes, sounds, and smells of the Quarter, or the Vieux Carré, are unique to this city. The Quarter's popularity among visitors, however, has resulted in a district that's full of tourist traps: cheesy t-shirt stores, bad restaurants slinging "gumbo" that no local would touch, and overpriced everything. Tucked among these schlock-slingers, though, are many of the city's finest restaurants, most intriguing museums, and best music venues. You just have to know where to look. In this one-day itinerary, you'll see some of the best that the French Quarter has to offer: you'll eat some of New Orleans' legendary dishes, hear some fabulous traditional jazz music, see many of the city's most beautiful buildings, get a crash-course in the history of the city, and even learn a little bit about famous New Orleans hauntings and get a glimpse of some voodoo traditions. Let's go! Start your day off at one of the world's most famous coffee shops, Café du Monde, at 800 Decatur St. A breakfast of crispy, sugar-coated beignets (French donuts) and a generous cup of steamy café au lait (chicory-laced coffee with milk) will cost you less than $5 (it's cash-only, though, so bring some). While you sip and chew, enjoy the view of the St. Louis Cathedral and Jackson Square, an old-world style plaza, surrounded by gorgeous buildings. If beignets don't appeal, try one of these excellent French Quarter breakfast joints for a variety of alternative options. If you have time to kill between breakfast and 10:30, when our next activity starts, you might stroll through the French Market (adjacent to the Café du Monde) looking for souvenirs, or walk into Jackson Square to watch a street performer or have your fortune told. As 10:30 approaches, head toward the 1850 House Museum bookstore, where you'll meet up with a docent from the Friends of the Cabildo historical preservation society for a fascinating walking tour of the French Quarter, which focuses on history, architecture, and folklore. Tours are $15 ($10 for students) and do not require an advance reservation. Alternatives: The Historic Voodoo Museum at 724 Dumaine St. offers a 3-hour supernaturally-themed French Quarter walking tour which includes entry to the museum and a trip to Marie Laveau's tomb in St. Louis Cemetery No. 1. It also starts at 10:30 and costs $19; reservations are recommended. If a walking tour doesn't appeal, consider a tour in a horse-drawn carriage. A one-hour tour with the excellent Royal Carriage Tours (found at Decatur Street at Jackson Square) will cost $150 (up to four people included, no reservations required). The drivers are all licensed tour guides and will teach you all sorts of fascinating things about the city. For a unique, affordable, and hearty lunch, head over to the Central Grocery at 923 Decatur for a muffuletta, an enormous sandwich (you can order half, or split a whole one with somebody) stuffed with olive salad, cured meats, and cheese. Take the sandwich and stroll over to the river's edge to sit on a bench and watch the mighty river roll by while you eat your lunch. Alternatives: If you'd like a wider variety of po-boys (the New Orleans answer to a sub/grinder/hoagie), try Johnny's Po-Boys at 511 St. Louis. If you've got something more stick-to-the-ribs in mind, go for Coop's at 1109 Decatur for Cajun fare: jambalaya, gumbo, and all manner of other rich, heavy dishes. It ain't fancy, but it's good. If all of this rice and gravy business is getting to you and you need something lighter, Green Goddess, at 307 Exchange Place, offers a delicious, affordable lunch menu with an international flair that actually, you know, includes green vegetables on the plate. Use the afternoon to revisit any of the places you saw from a distance on your tour but didn't get a chance to stop into. Consider a quick jaunt to the fascinating Pharmacy Museum at 514 Chartres, and if you opted for the Friends of the Cabildo walking tour in the morning, stop into the Historic Voodoo Museum at 724 Dumaine. Both of these museums are small but mighty, and neither will take more than an hour, and more like half an hour, to visit. If you like art, you might also consider strolling down Royal Street to see the many art galleries located there. And if antiques float your boat, don't miss M.S. Rau, an ultra-high-end antique dealer whose storefront is like a museum of decorative arts. If you're looking for uncommon souvenirs, one of my favorite places is Kitchen Witch, a cookbook store at 631 Toulouse St., where you can pick up a great Louisiana cookbook and, if you'd like them, dinner recommendations. Another fun stop for souvenirs is a simple one: Rouse's, at 701 Royal Street. Yep, it's just a plain old grocery store, but if you've never browsed the spice or seasoning sections at a Louisiana grocery store, you're in for a treat. But really, you can also use this time to just stroll aimlessly. The Quarter is quite safe in the afternoon, and it's great fun to just people-watch and window shop your way around the district, without too much of an agenda in mind. Who knows what you might find? For dinner, consider taking in one of New Orleans' old-line restaurants, most of which are found in the French Quarter, for a taste of times gone by. Antoine's, the oldest family-run restaurant in the United States (it dates back to 1840) is a good choice, but make sure you have a jacket, fellas, as they're required for men. Alternatives: Though the old-line restaurants are tremendous fun, the food itself is less of a draw than the overall ambiance and experience. The food is plenty good, but it won't change your life. If you're a real foodie, consider dinner at Susan Spicer's Bayona, at 430 Dauphine St., or Emeril Lagasse's NOLA, at 534 Saint Louis St., both of which offer excellent gourmet cuisine that is New Orleans-based with global twists. If all that is a bit rich for your blood, or if you've got Creole cuisine fatigue, try Bennachin, at 1212 Royal St.
Bennachin specializes in West African cuisine, and does it beautifully. You can't come to New Orleans without hearing some live music, and one of the best venues in town is Preservation Hall, at 726 Saint Peter St. Doors open at 8:00 almost every night (except when there's a festival on) and the music starts at 8:15. The venue is all-ages with no drinking or smoking allowed, and the music is world-class. The spectacular Preservation Hall Jazz Band is the house band and plays more often than not, but even if they're off on tour, their seats are filled by some of the town's many other great jazz musicians. Admission is $15 per person. 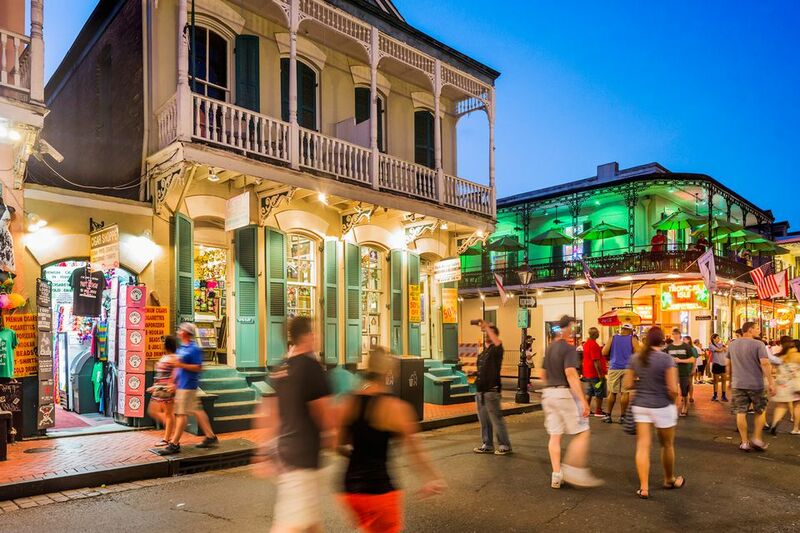 After your jazz experience, it's time to take in Bourbon Street, at least for a bit. Stroll down to 941 Bourbon St., where you'll find Lafitte's Blacksmith Shop, the oldest continuously-operating bar in the United States. Legend has it that pirate Jean Lafitte once kept a shop here as a front for his smuggling activities. They say it's quite haunted, and it's got atmosphere aplenty regardless, especially given the lack of electric lights; it's candles only here. It's a great place for a romantic drink or ghost-hunting (or both). And from there, you can choose your own adventure. Head back to the hotel and get a good night's sleep? Stroll a bit further down Bourbon and see what kind of trouble you can get into? Perhaps a combination of the two? It's up to you, friend.